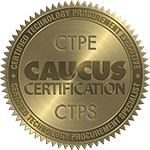 Your CTPE designation must be renewed every three years. Renewal is based on an accumulation of points or by re-application and re-examination. For each three-year period, there is a renewal fee of $250 for members and nonmembers. Continuing Education Credits must be submitted along with the renewal fee before the expiration date. To retain the CTPE credential, you must accumulate 40 credits of Continuing Education (CE), professional development or other areas such as leadership, instruction, or writing every three years and submit a completed CTPE renewal report form. Points for renewal can be earned starting from the date appearing on the CTPE certificate for the first renewal or from the date of the last renewal, whichever is applicable. Serve as member of a Committee relevant to technology procurement.